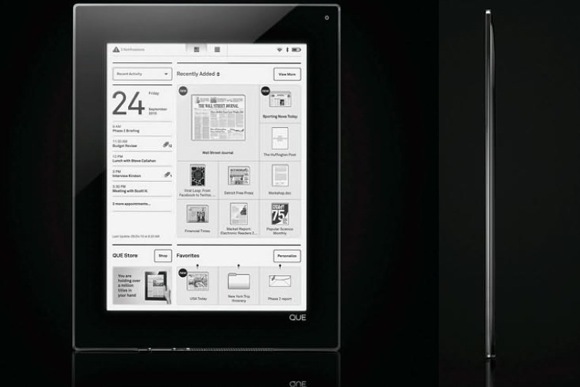 We’ve been following the Plastic Logic e-reader since the flexi-screened machine was just a sweetly designed e-ink show-off device. It’s been revealed in full today, and it’s transformed into a hard working business machine. The device is so specialized for business uses that Plastic Logic is calling it the “World’s first proReader.” It’s being presented as “more than an eReader,” and there’s merit to that since it’s specifically designed for providing full-on business document workflow and organizational functionality–the sort of things a mere e-book reader like the Kindle can’t do. During the CES 2010 launch presentation that just finished, the Plastic Logic team showed off how the Que works, and it’s unquestionably living up to some of those promises. That’s evident from Que’s home page: No simple logo or list of e-books loaded onto the machine, it’s more of a desk manager-diary-email summary. Lots of attention was lavished on the calendar functionality, with its wireless Microsoft Exchange hook-ups that mean you can embed files directly into meeting data and emails. And instead of simply reading the attached e-texts, such as you would with a Kindle, you can actually edit them–Word files, PDFs, and so on–to a limited extent as if you were still using a traditional PC. And that includes scribbling notes on the capacitive touchscreen (which can be embedded into the document back on a computer), adding annotations, and imprinting them with pre-shaped “stamps.” Its also got built-in BlackBerry interactivity so that you can grab documents off the tiny RIM screen and use them more easily on the big 10.7-inch e-ink screen–and a tie-in with RIM underlines that business functionality Plastic Logic is promoting. There’s even a neat “print to Que” function, which could reduce the laser-printing burden for some business users. Plastic Logic’s partnership with Barnes and Noble was also described. This was a confusing alliance at first, given the bookstore’s own entry into the e-reader space with the nook e-reader. But it makes more sense now: B&N are providing some of the ecosystem of the Que Store–which is mainly aimed at accessing pre-printed business content like magazines (including Fast Company) and books, though there’s also access to the larger B&N bookstore (which supports the nook too). And all of that sounds great–it makes the Que sound very much like a real-world, business-centric digital tablet/slate/clipboard somewhat like those gizmos used techies wandering the bridge of the starship Enterprise in Star Trek. But there are two problems. The first is Web browsing. During the Q&A the Que team revealed that there was a browsing capability built into the Que firmware, but it’s not accessible to the user because the slow browsing experience on an e-ink machine isn’t up to the level that users are used to on laptops. It’s smart that they’ve disabled this, since the “experimental” browser on the Kindle is more of an embarrassment than a feature. But it’s also functionally limiting the Que. And then there’s the biggest issue: The Que is only available in the U.S. at first, and it’s expensive. There’s a 4GB model that fits in 35,000 documents, has Wi-fi, Bluetooth and USB connectivity, and an 8GB one that’ll squeeze in 70,000 documents and also has 3G connectivity via AT&T. The 4GB device will cost $650 and the fully-connected 8GB one will be $800. The Que is an innovative new category of machine, but Plastic Logic has almost priced themselves out of the market. Which market am I talking about? The slate PC one, mentioned by Microsoft yesterday, and which we’re expecting Apple to dominate with a full multifunction slate PC, which will cost somewhere near $1,000 if rumors prove true. Wouldn’t you spend $200 more on an iSlate so you could watch movies on the flight to your business meeting, browse your email and the Web, and then use the thing to give your presentation too?